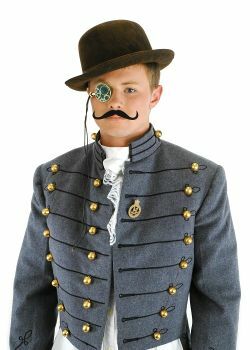 EL411831 - Steampunk Costume Kit - Brown Bowler Hat, Green Monocle and Mustache - Costume Accessory. Costume suggestions: steampunk. Kit includes: hat, monocle, mustache. Kick your steam-powered engine into high gear with this authentic steampunk kit. Complete with bowler style hat, monocle and Victorian style mustache, this is the perfect accessories kit for your steampunk costume.